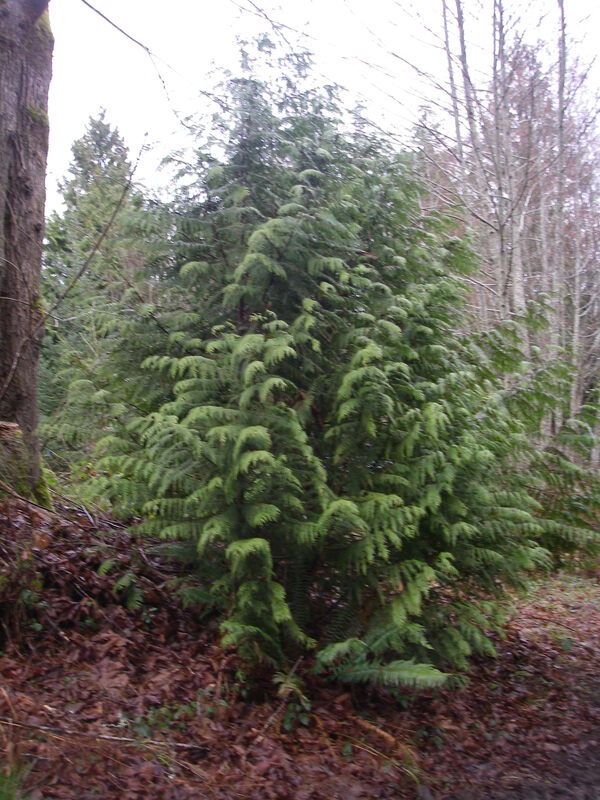 Names: Western Red Cedar is also known as Giant Arborvitae. Arborvitae literally means “tree of life.” Plicata means plaited or folded like a fan; referring to how the leaves are folded and compressed next to the tree’s branchlets. Relationships: It is one of only four species in this genus; two are from eastern Asia. 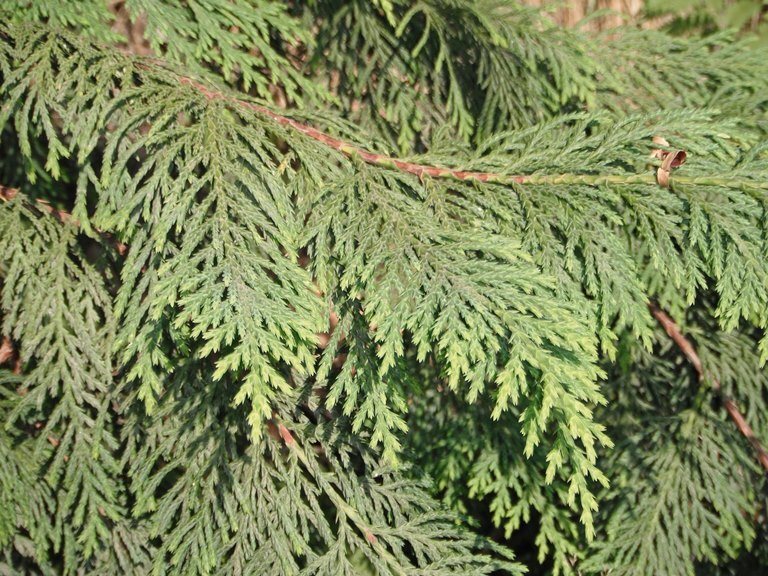 The American Arborvitae or Northern White Cedar, Thuja occidentalis is native to the northeastern United States and eastern Canada and has several cultivated varieties, with columnar forms that make good screens and smaller “globe” forms that are good for foundation plantings. 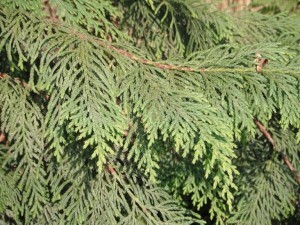 Many different types of trees are called “Cedars” see the article on What is a Cedar? for more information. 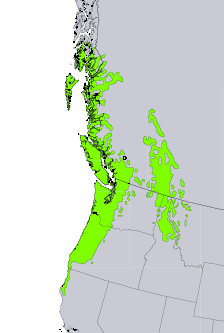 Distribution: Western Red Cedar grows from southeast Alaska to northern California and east to northwestern Montana. 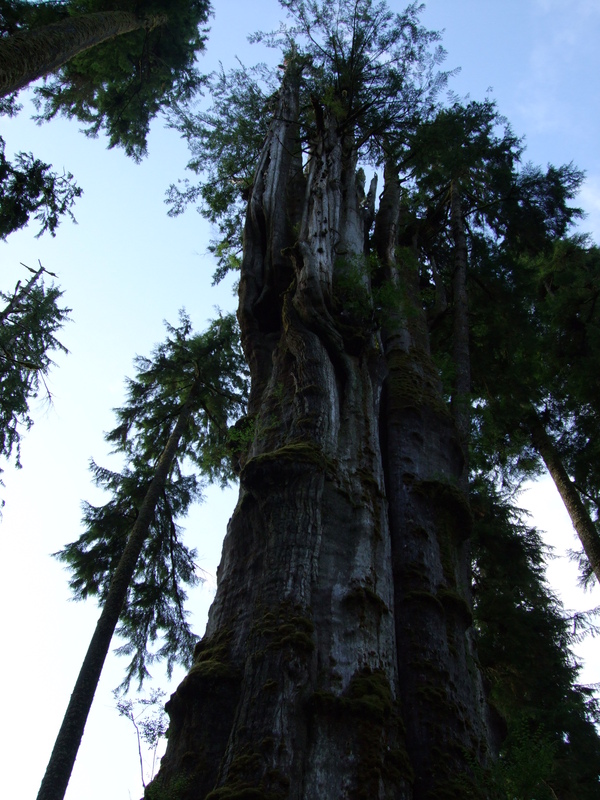 The largest Western Red Cedar is near Lake Quinault in the Olympic Rainforest. Only about a 2 foot wide strip is still alive. 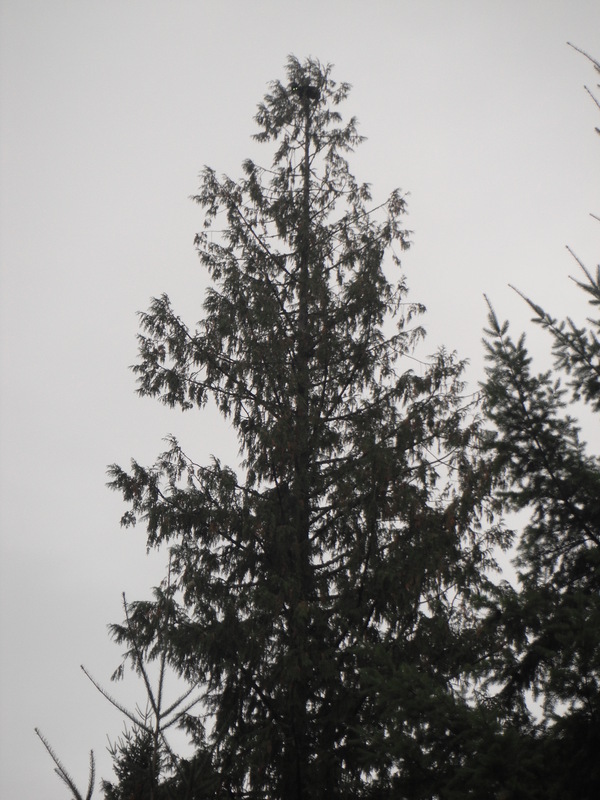 Growth: Western Red Cedars typically grow to 120-150 feet (35-45m); the tallest today are about 200 feet (60m) tall. The widest are about 19 feet (6m) in diameter. 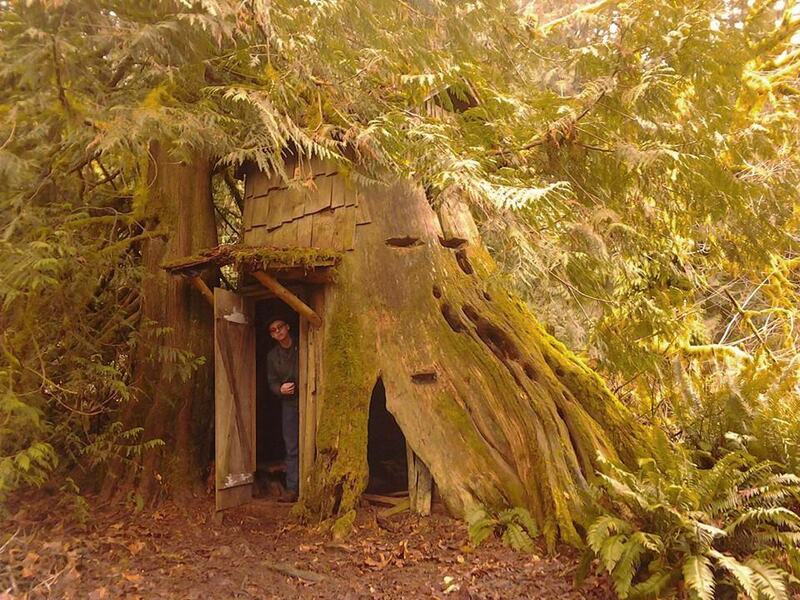 These giants are found mostly in the old-growth coastal rainforests of the Olympic Peninsula and Vancouver Island. Some may be 1400 years old or older. Cedar bark in vertical stripes of red & gray. Scale-like leaves are tightly compressed against the branchlets. 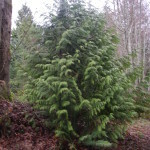 Diagnostic Characters: Western Red Cedar is easily recognized by its reddish or gray fibrous bark. The scale-like leaves are pressed tightly to stems, having the appearance of flattened braids in lacy sprays. The foliage has a sweet chamomile or tansy odor when crushed. Cinnamon-brown cones are small and elongated and stay attached to branches for a long period of time. Large branches emerge from the main trunk and droop downward, turning up at the ends. In the landscape: Trees can be planted singly or in groves. They look best when lower branches are allowed to spread, drooping down to the ground and arching back up again. 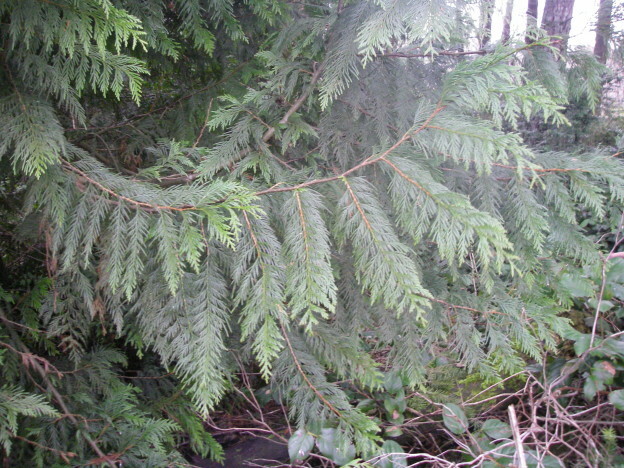 Western Red Cedar prefers moist to wet soils. 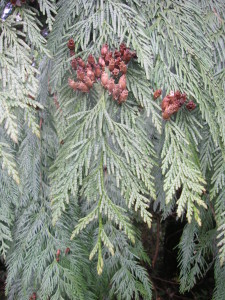 Persistent woody cones of Western Red Cedar. Phenology: Bloom Period: Mid-spring; Mid-April is typical, but may range from March-June (earlier in southern coastal areas; later at high elevations, interior and northern stands). Cones mature in August; seeds are dispersed September through November. 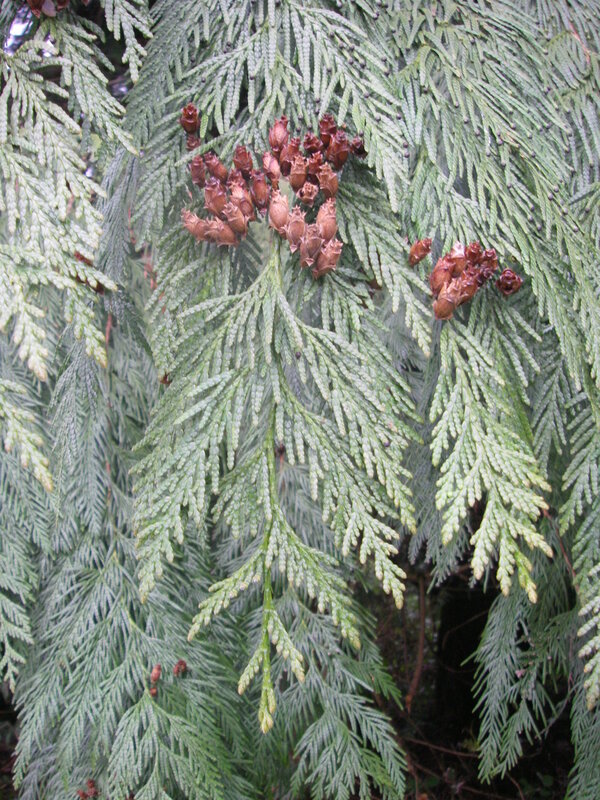 Propagation: Seeds of Western Red Cedar do not require a stratification period, however, a stratification period at 40ºF (4ºC) for 60 days may aid germination in dormant seeds. Seeds may remain viable for 7 years stored dry at 0º F (-18ºC). Germination rates vary from 34-90%. Seeds should not be covered; they germinate on the surface of the soil. Heel cuttings (cuttings where a small piece of older wood is retained at the base) are best taken July-September. Rooting is most successful when cuttings are treated with 2000ppm IBA, stuck in a sand-perlite or peat-perlite media and overwintered in a cold frame. 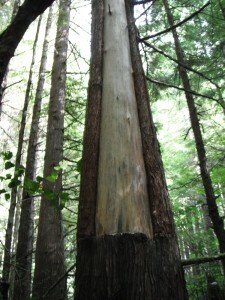 Western Red Cedar may also be propagated by layering, which often occurs naturally in the wild. 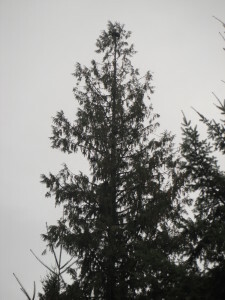 Seedlings and naturally layered cedars are easily transplanted. 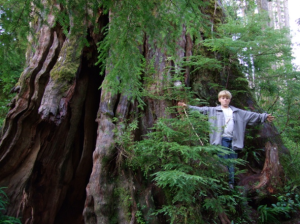 Use by People: Western Red Cedar was the most important tree to native people. 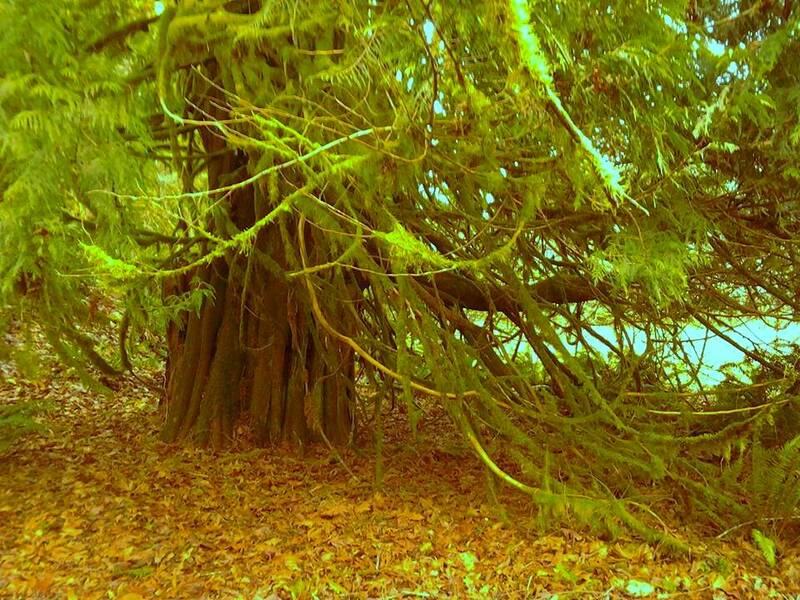 For them it really was the “tree of life.” Native people rarely felled cedars; instead they used fallen logs or split off boards from standing trees. The decay resistant wood of these trees was used for building long houses, totem poles, canoes, cradles, and many kinds of tools and other items. Women collected the bark by making a horizontal cut in the bark, prying it up and pulling out away from the tree, leaving a long wedge-shaped scar. 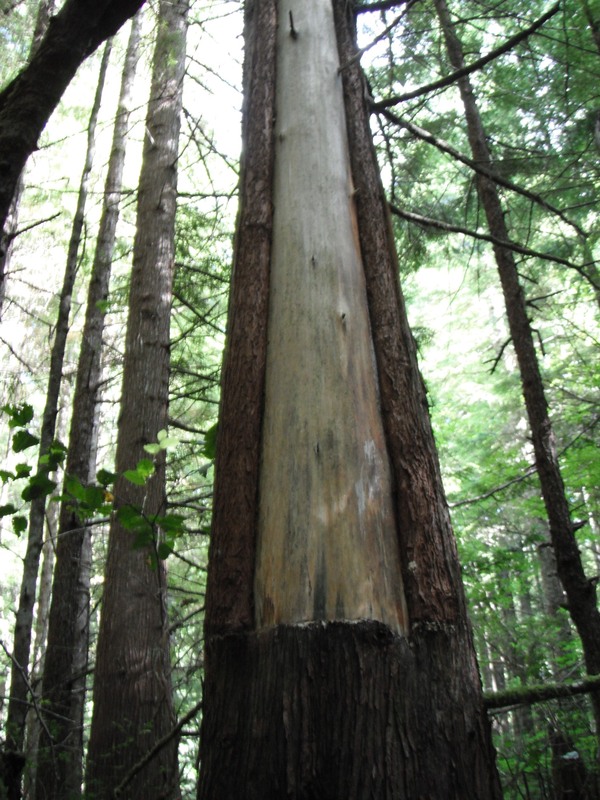 Some of these “culturally modified trees” can still be found along hiking trails. 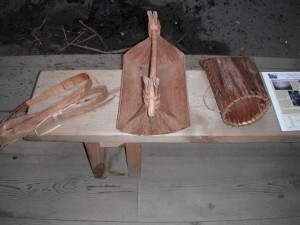 The bark was shredded, woven and made into clothing, mats and other items. 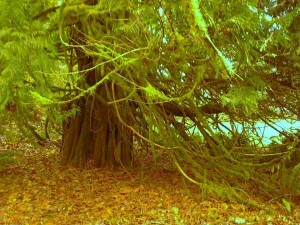 The limbs of cedar trees were twisted into rope. Baskets were made from the roots. 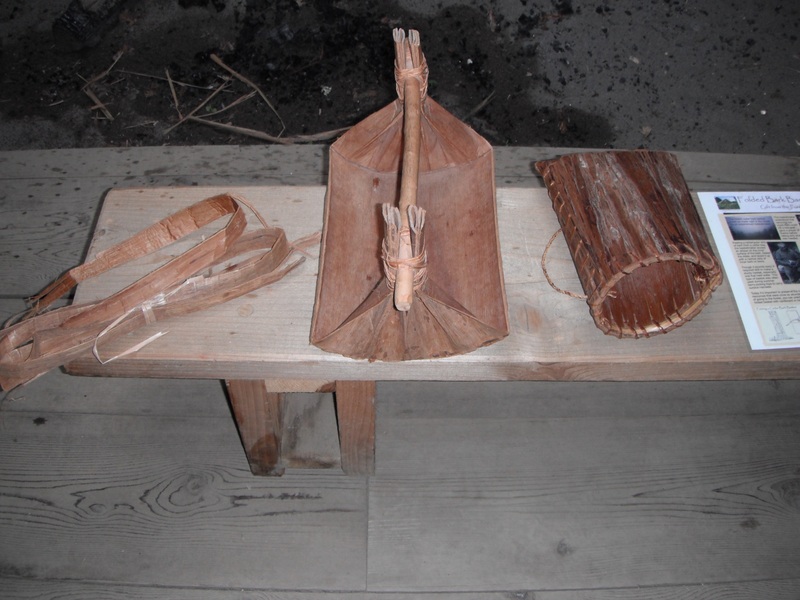 A bailer & berry picking basket from the Cathlapotle Plankhouse located on the Ridgefield National Wildlife Refuge. 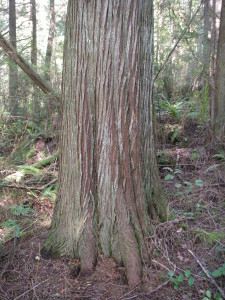 Western Red Cedar is still an important timber tree today although the second-growth wood is not as resistant to decay, as was the old-growth wood. The production of Cedar shakes and shingles was a big business in the last century, but has declined due to limited availability of old-growth wood and building codes designed to reduce the risk of loss due to fire. Western Red Cedar is still frequently used for interior and exterior siding, decks, fencing, other outdoor structures and furniture. 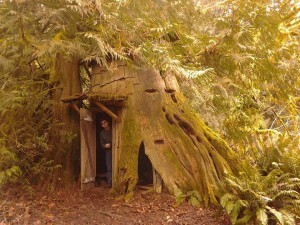 Western Red Cedar stumphouse at Guillemot Cove Nature Preserve in Seabeck. 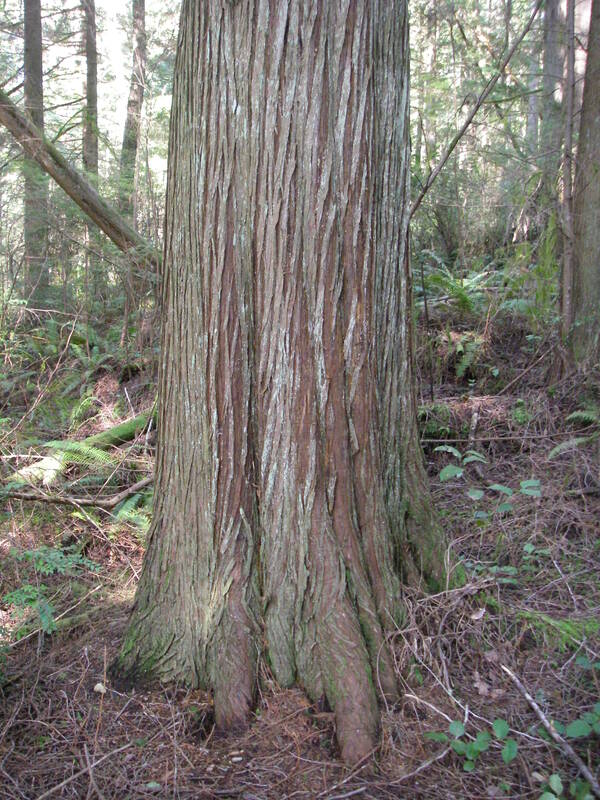 Use by Wildlife: Western Red Cedar provides cover for several wildlife species. The seeds may be eaten by Pine Siskins. Deer and elk eat the foliage and twigs. Small mammals use cavities in Western Red Cedars for dens; birds use cavities for nests. An old Cedar growing within the trunk of an older burned out stump with typical swooping branches. 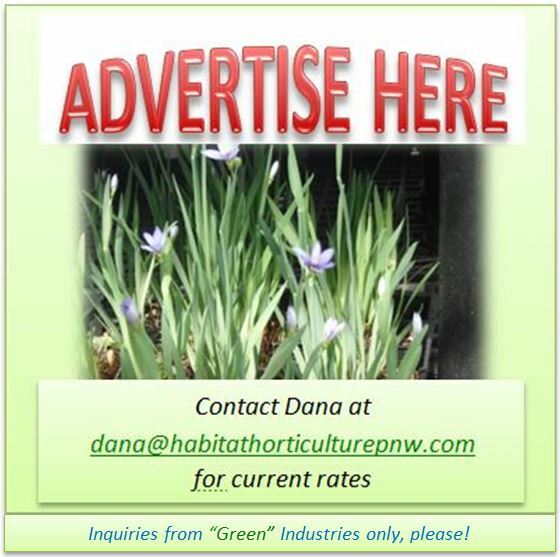 This entry was posted in Conifers on January 29, 2014 by habitatdana.